These pumpkin pie bars are loaded with streusel and are a fun alternative to traditional pumpkin pie! With gluten-free and 100% whole grain options. I originally wanted to make an almond flour based crust and top it off with the same streusel topping I used here, but then I realized how dumb that was. That would have dirtied up another two bowls and made the whole process even longer. 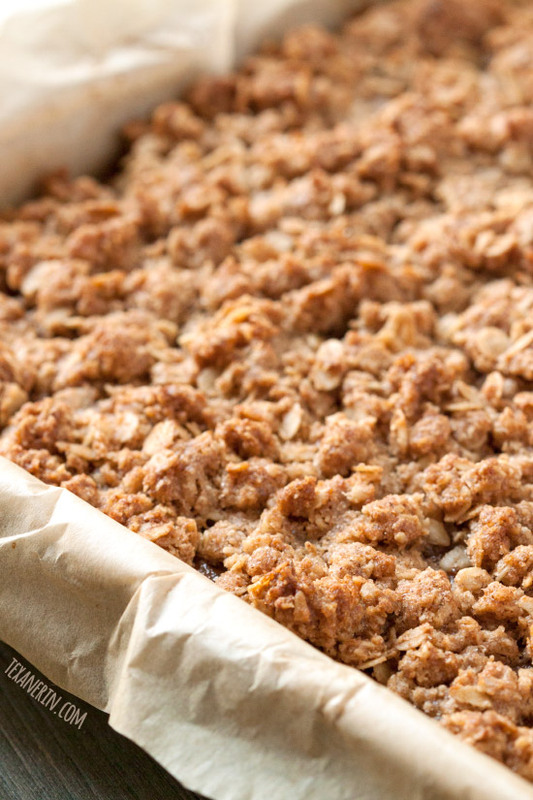 Plus, let’s be honest – an almond flour crust wouldn’t have been as good as this streusel-like one. I love baking with almond flour but it’s just so darned hard to compete with oats and oat flour. So now you’ve got one mixture for the crust and topping. The result is incredibly easy and it couldn’t be tastier. I used oats and oat flour making these pumpkin pie bars gluten-free and 100% whole grain but I kind of dropped the ball on the dairy-free thing. I bet you could use canned coconut milk for the evaporated milk in the filling. But using coconut oil instead of butter in the streusel in the crust / topping would probably require a little reworking (a slight reduction in the amount of fat). If you try it out, I’d love to hear how it goes! Maybe ice cream would also be good? Or maybe not. I don’t think I’ve ever had a pumpkin dessert served with ice cream. I guess it’s time to try that out! Something else I’m not sure about is doubling the recipe for a 9″x13″ or using a tart pan. I think some more experimenting is in order! For another tasty gluten-free pumpkin dessert, try this gluten-free pumpkin pie cheesecake from Dishing Delish! 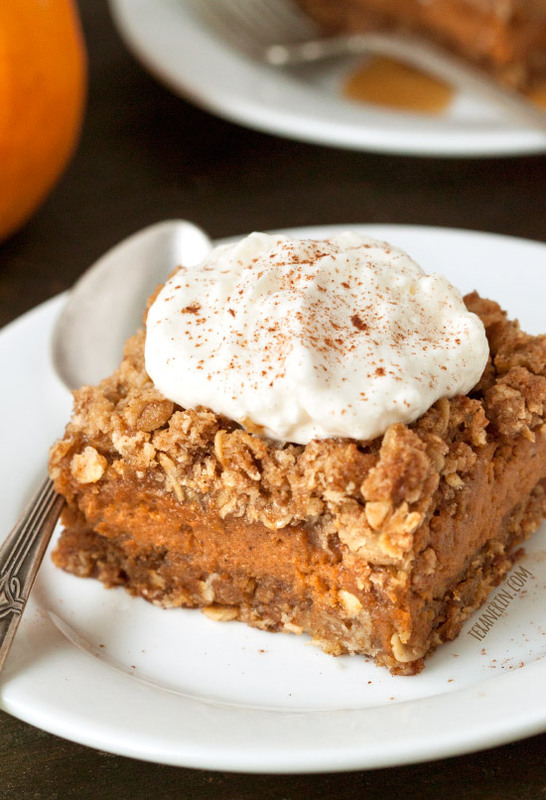 This no-bake pumpkin Nutella cheesecake or these pumpkin caramel layer bars also look awesome! Preheat the oven to 350 °F. Line an 8" x 8" pan with parchment paper and set aside. Prepare the crust and topping. In a large mixing bowl, stir together the oat flour, oats, cinnamon, sugar and salt. Stir in the butter until well combined. Pat half of the mixture firmly onto the bottom of the prepared pan. Bake for 18 - 22 minutes or until lightly golden brown. The crust will bubble a little during baking. Let the crust cool for 5 - 10 minutes while preparing the filling. In a large mixing bowl, stir together all the filling ingredients. Pour evenly over the crust and bake for 12 minutes. Remove from the oven and add walnut-sized pieces of the remaining oat mixture over the filling. It will be a very thick layer and some of it will sink a little into the filling. Bake for another 30 minutes or until the filling is golden brown and firm and the middle is set. Let cool for 1 hour and serve with whipped cream or maple caramel sauce. Cool completely before covering. Store at room temperature for up to 2 days or in the refrigerator for up to 4 days. You can also make your own oat flour! To make oat flour, pulse quick or rolled oats in a food processor or coffee grinder until finely ground. If you don't have pumpkin pie spice on hand, make your own using 1 teaspoon cinnamon, 3/4 teaspoon ginger, 1/2 teaspoon allspice, and 1/4 teaspoon nutmeg. 115 comments on “Pumpkin Pie Bars (gluten-free, whole grain options)” — Add one! This looks amazing. Can you recommend a gluten free substitute for the oats and oat flour? I react to gluten free oats as many people with celiac disease do. TIA. Thanks! But I unfortunately can’t. I’ve not found a good sub for oats or oat flour. So yummy and my guests were impressed too! I’m happy to hear that you and your guests enjoyed the bars! Your vanilla sugar whipped cream sounds heavenly. :) Thanks for your comment! These look amazing! I love having gluten free options in addition to all of the other favorites. 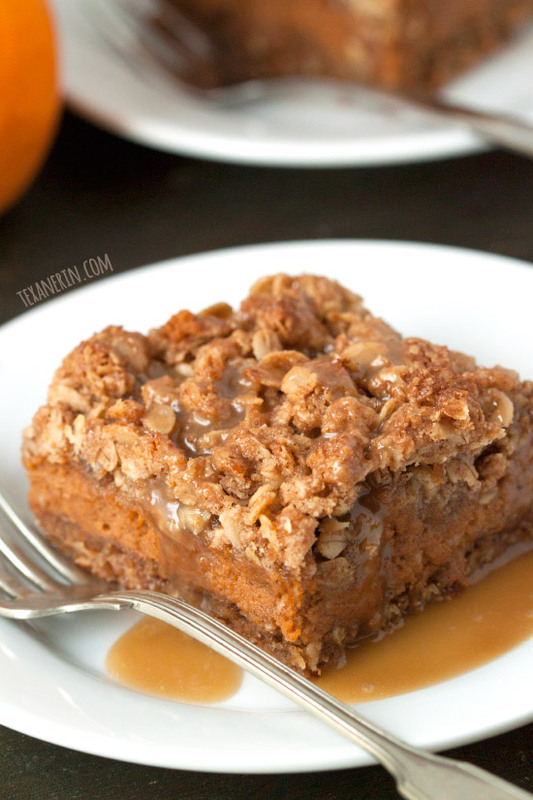 The streusal bars are an unbelievably delicious pumpkin dessert, i was looking for a good thanksgiving treat for my grandaughter and it ended up being so scrumptious everyone would have had 3rds if they could have. I never made the carmel sauce (don’t think it was missed) but had lactose free whipped cream. From now on this is our new holiday dessert. I’m so happy that everyone enjoyed the pumpkin bars! And it makes me so happy to hear that this is your new holiday dessert. I’m honored. :) Thanks so much for your feedback! Janine’s comment – Just made these, but substituted baked apples for the pumpkin. I also used quinoa flour instead of the oat flour, as that is what I had. It came out great and was a hit at dinner last night! Seems like it is a pretty flexible recipe. Erin, YUMMY! I made a few minor changes, I used Truvia baking blend in place of the sugar in the filling. Wow, these are totally amazing. My hubby ‘found’ them when he got home from a trip and has been taking sneak bites for two days. LOL Thanks for a new favorite recipe. Aww, thanks. What a nice thing to say! :) And allspice isn’t a mix of spices – it’s just allspice. Here’s some info on it. And here’s a recipe for a sub. I hope that helps! I love all sorts of holiday treats, but sugar cookies are one of my favorites. My favorite Christmas treat is Peppermint Bark. My mom used to make candied pecans and buckeyes every year! I’d pass out baggies of the pecans to friends at school. They would look forward to it just as much as I did. The house smelled amazing. I LOVE LOVE LOVE pumpkin bread. Mothers make it best! My favorite holiday treat is egg nog and the best I’ve ever had is one I made using Alton Brown’s recipe. My favorite holiday treat is probably chocolate ice-box pie! My fiance makes me these dairy free gluten free sugar free peppermint patties this time of year. They are why I am marrying him. I love truffles! When my youngest daughter attended the Culinary Institute of America in Hyde Park, NY she brought home samples of the various sweets that she made in her classes-her truffles were my favorite. She then went on to make $1000 worth of them during Christmas break to sell to my friends. My father was born in Germany and became a master baker there. He would have been impressed with how well my daughter bakes and how hard she works. Erin replies to Sandy S.
It’s really hard to pick just one favorite, but I’ll go with Apple Cake. Just made these, but substituted baked apples for the pumpkin. I also used quinoa flour instead of the oat flour, as that is what I had. It came out great and was a hit at dinner last night! Seems like it is a pretty flexible recipe. I love the caramels my mom makes! My favorite holiday treat is anything with pumpkin. So I lived in Europe for 7 years and I am very familiar with most of these chocolates! European chocolates are the BEST! Thanks for the giveaway! My favorite holiday treat is peppermint bark! You’re welcome! And where did you live? :) I have 5 years in Germany and 2 separate years in Sweden! Every year my mom would make extremely basic sugar cookies that me and my sis would douse liberally with sprinkles. So good! Now, I can’t eat them, so I’m the one making them instead! Although I miss their buttery taste, it’s just fun to watch my family get to devour the goods that I once loved. I’m sad that you can’t eat them, though. :( Have you found a good sub?